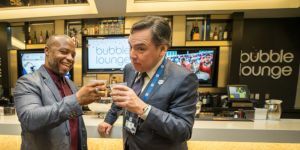 The first champagne bar in the NFL, the Bubble Lounge is the perfect location for holiday parties, wedding or baby showers, engagement or birthday parties and corporate receptions. 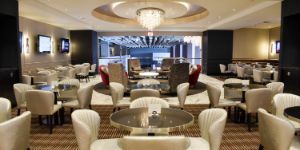 Located on the Loft Level of State Farm Stadium, Bubble Lounge provides an upscale, modern area complete with luxurious dining and lounge furniture, large stone bar, digital monitors and private restrooms. To inquire about Bubble Lounge's availablity for an upcoming event, contact State Farm Stadium to obtain a customized proposal.